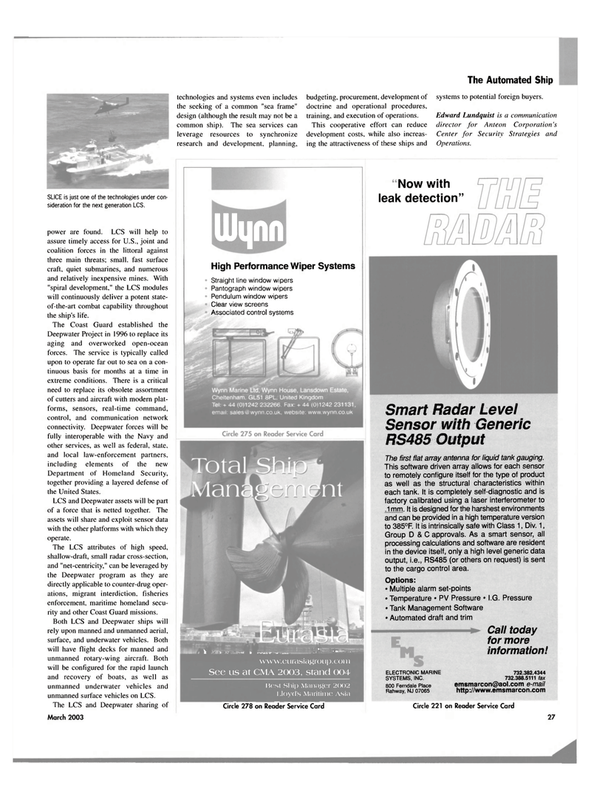 SLICE is just one of the technologies under con- sideration for the next generation LCS. power are found. LCS will help to assure timely access for U.S., joint and coalition forces in the littoral against three main threats; small, fast surface craft, quiet submarines, and numerous and relatively inexpensive mines. With "spiral development," the LCS modules will continuously deliver a potent state- of-the-art combat capability throughout the ship's life. Department of Homeland Security, together providing a layered defense of the United States. The LCS attributes of high speed, shallow-draft, small radar cross-section, and "net-centricity," can be leveraged by the Deepwater program as they are directly applicable to counter-drug oper- ations, migrant interdiction, fisheries enforcement, maritime homeland secu- rity and other Coast Guard missions. March 2003 technologies and systems even includes the seeking of a common "sea frame" design (although the result may not be a common ship). The sea services can leverage resources to synchronize research and development, planning, budgeting, procurement, development of doctrine and operational procedures, training, and execution of operations. This cooperative effort can reduce development costs, while also increas- ing the attractiveness of these ships and systems to potential foreign buyers.